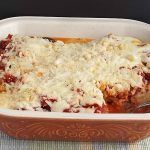 This is an easy recipe for eggplant Parmesan even though it's a two process procedure. First you bread and fry the eggplant and then cover with sauce and bake. The sauce will either make or break this recipe so for goodness sake, make a delicious sauce! I have a great make from scratch sauce or you can use one off the shelf, up to you.Note: You can change the number of people served by placing your cursor over "Servings". The Ingredients will adjust to the new number of servings. Toss the eggplant with 2 tablespoons of salt in a colander and let drain for at least 30 minutes. While eggplant drains, place a center rack in oven and preheat to 375 degrees F. Now make the sauce. With your hands, smash and tear the canned tomatoes into small pieces and place into a blender cup and puree. You can do this in batches if necessary. Heat the 3 tablespoons of oil in a deep skillet or pot and add chopped onion and garlic, do not burn the garlic. Add the pureed tomatoes, the thyme, oregano, basil leaves, ground pepper and hot pepper flakes and simmer, stirring occasionally until slightly thickened for about 25-30 minutes. Don't forget to take out the 3 sprigs of Thyme. Your sauce is now ready. Place a baking sheet in the 375 degree preheated oven to get hot. Take the now drained eggplant and dry off each slice, both sides. Stir together flour and 1/4 teaspoon pepper in a shallow bowl. Lightly beat the 5 eggs in a shallow bowl, then stir together the Panko and 1/3 Parmesan cheese in a third shallow bowl. Working with 1-slice at a time, dredge eggplant, both sides, in flour, shaking off excess, then dip in egg, letting excess drip off and dredge in panko until evenly coated. Transfer eggplant to sheets of wax paper, arranging slices in 1 layer. Take the now heated baking sheet out of the oven, spread the 3 tablespoons of olive oil over the sheet and place the battered eggplant onto the hot baking sheet and place on middle shelf. Bake for 15 minutes, flip and bake for another 10 minutes. Take out of oven and raise the temperature to 400 degrees F.
Spray a 9 x13-inch baking dish and place 1/3 of the sauce in the bottom of the dish. Place 1/3 of the eggplant in a single layer and cover with 1/3 of the mozzarella. Continue layering with remaining eggplant, sauce and mozzarella. Sprinkle top with remaining 1/3 cup Parmesan cheese. If you don't wish to make the sauce yourself, you can substitute about 7 cups of your favorite store bought pasta sauce and just follow the directions.